Falls are one of the leading causes of injuries in the workplace. As you work to mitigate the dangers of falls in your facility, keep the differences between arrest and restraint in mind as you put safeguards in place: Fall arrest means to be caught while falling and fall restraint means to be restrained from falling in the first place. For Tom Trinen of Service One, Inc. and Service One Access, Inc., the JLG Compact Crawler boom lift is a key component to his success in two Chicago businesses: window cleaning and equipment rental. The same maneuverability and light-weight design that makes using the Compact Crawler ideal for cleaning the windows in churches and museums makes it a favorite for rental customers that need an agile, flexible solution for their own facilities. The National Safety Council (NSC) reports that injuries from falls continue to be a persistent problem for the construction industry as well as the health services, wholesale and retail industries. The NSC suggests that much more can be done to eliminate unsafe practices in the workplace. How Can Employers Mitigate the Risk of Slips, Trips and Falls? In a recent article, Safety+Health Magazine addressed the second most common cause (in 2011) of work injury or illness: slips, trips and falls. Workplaces with high foot-traffic, like retail stores, warehouses and healthcare facilities can dramatically lower the rates of these injuries by taking simple precautions that are too-often overlooked. According to a study published in The Journal of the American Medical Association a national CPR campaign in Denmark lead to an increase in the survival of patients in need of emergency first-aid. These findings suggest that workplace first-aid training could have promising results. JLG Safety Courses, like the three-day Train-the-Trainer Course, provide comprehensive OSHA and ANSI compliant instruction on Aerial Work Platform and Telehandler operation to keep your team working smoothly and safely. Logging into JLG University connects you to online service and safety training resources and helps you to manage your class enrollments and training records. 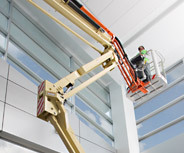 Look up: The Compact Crawler boom lift will be on display at booth 1939 at the TCIA Expo. As part of a nationwide outreach campaign to raise awareness for the hazards of workplace falls, OSHA is encouraging workers and employers to save lives through three steps: Plan, Provide and Train.